Late last week, the remnant of a badly damaged fishing boat was spotted off the coast of Oregon. Remarkably, the boat — adrift since the 2011 Tōhoku earthquake and tsunami — brought a number of fish along with it — and they're still alive. 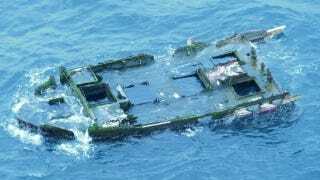 As reported in the Japan Times, the boat has drifted about 5,000 miles (8,000 km) in the four years since the tsunami struck the Japanese coast. The wreck measures about 29 feet (9 meters) in length and was likely part of a 50-foot (15-meter) fishing boat. The vessel was equipped with a holding tank, which is where the fish are trapped. During an investigation of the ship, the Orgeon Parks and Recreation Department discovered 20 yellowtail amberjacks and one striped beakfish — fish normally found in the coastal waters of Japan. The OPRD says the wreck needs to be disposed of, but the fish will be re-located to a local aquarium. Image: Oregon Parks and Recreation/AP/Kyodo.